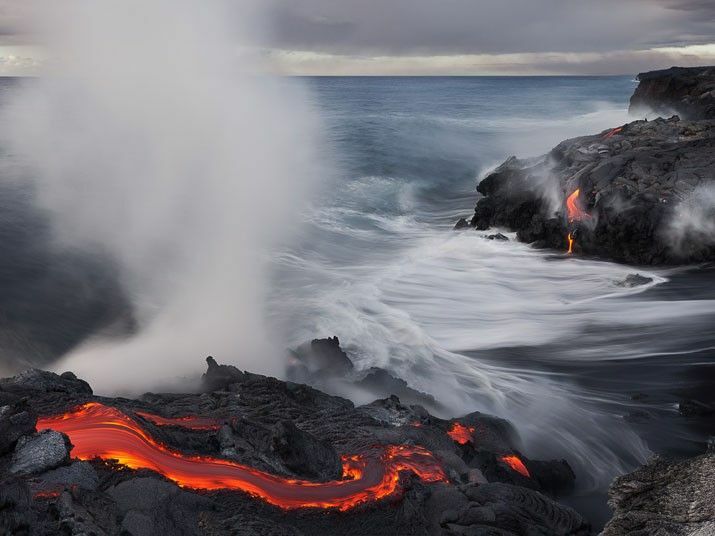 Photographers shooting Miles Morgan, volcanoes erupting volcano crept to as close as possible. 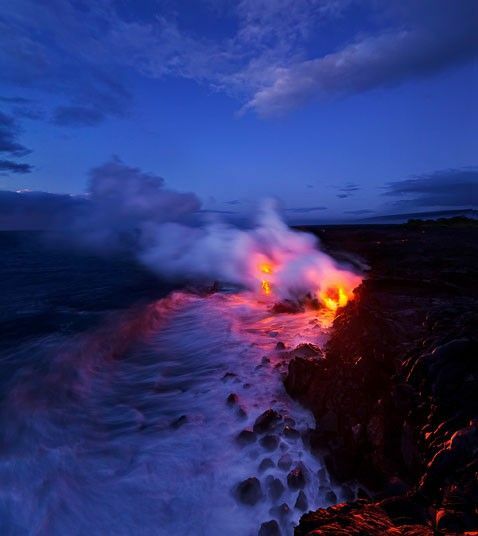 "If you very briefly, in a nutshell, is - unbearably hot," says Miles. "By that time I only got to the volcano, was the dawn, and the first rays of the sun lit up the ground. I set the timer on the camera and went against the flow of lava. Waves of heat scorched his face. The smoke was choking fit, I started to cough. And the temperature was so high that I literally began to melt shoe soles. I seriously feared for his tripod. This is dangerous, yes, and fraught with consequences - but a memorable spectacle and just an amazing experience. I'm not sure that's ever felt more alive than those moments. " 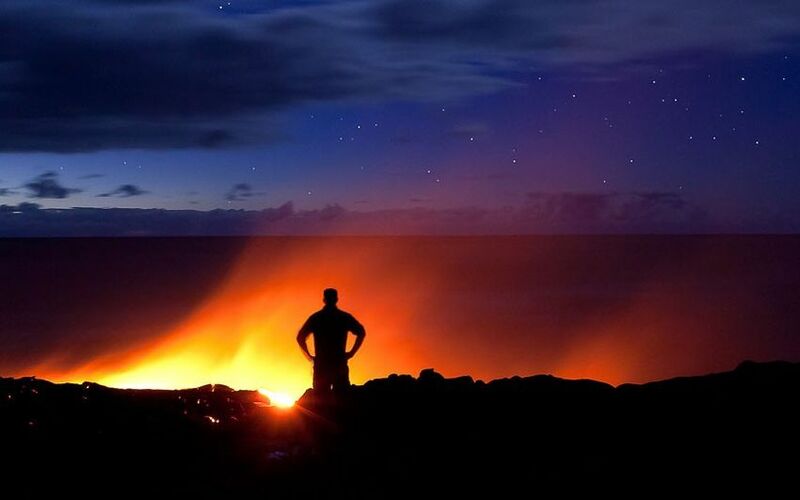 This - his self-portrait on the side of a volcano in Hawaii Kilaeua. In the picture - a portrait of Miles' colleagues, photographer Bruce Omori, which establishes a tripod on the side of the volcano. 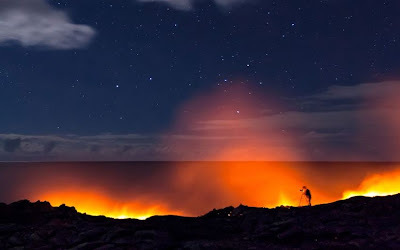 Volcano height Kilaeua 4100 feet is one of the youngest and most active volcanoes in Hawaii. 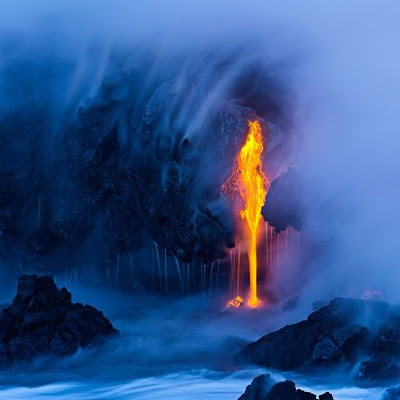 It erupts almost continuously since 1960th years. lava flows cover the distance of six miles, to the Pacific coast in four hours. 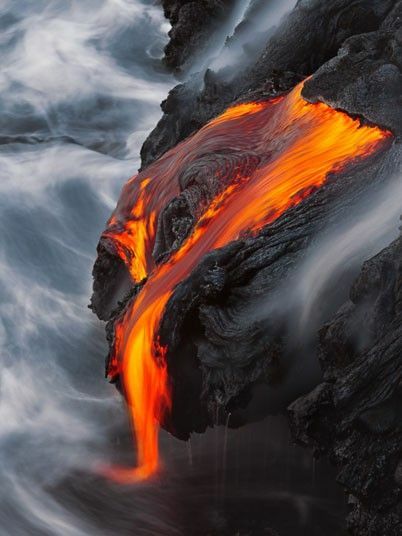 Miles managed to photograph the moment of first contact with the lava surface. Miles says: "When you are at a distance of 200 yards from the ocean, there is a danger of very serious and is quite real. 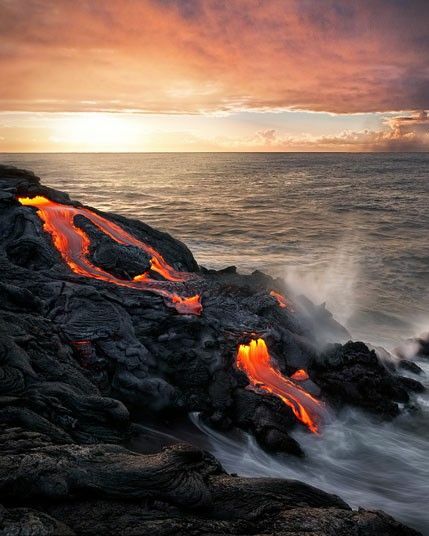 The land on which you stand, is that under your feet - this is actually hardened lava, which for the most part is far from stable. 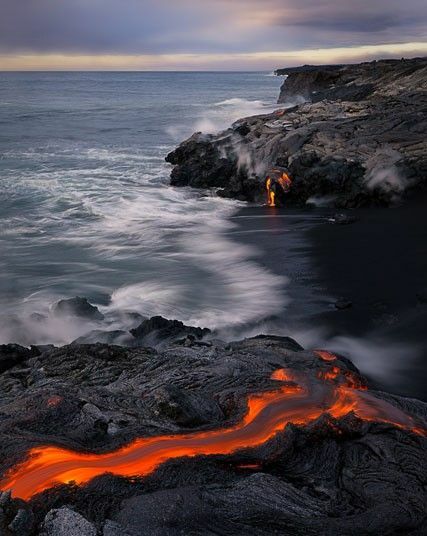 Under a layer of lava is constantly being eroded beach. 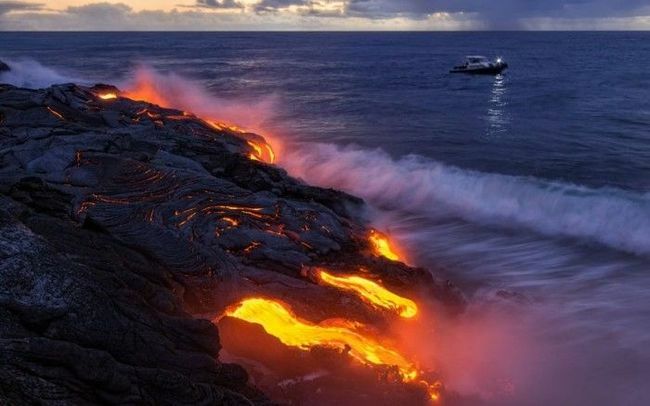 Lumps of lava falling into the ocean. 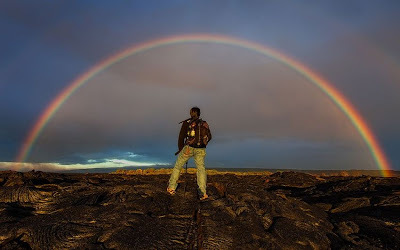 "In the photograph: a portrait photographer Bruce Omori against the backdrop of a rainbow on the slope of the volcano Kilaeua. "You go to the lava, the thin and so fragile cooled crust, which may be gaps in any time. Will break - and the chance for salvation you have not left. " "We must take into consideration the smoke and toxic gas. 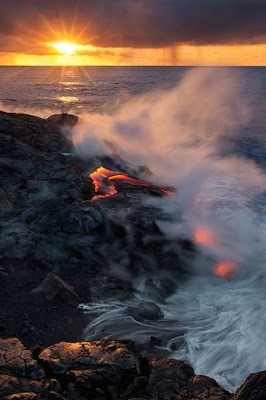 If a variable wind direction, risking suffocation, hitting a smoky cloud. A lot of people have died this way. " 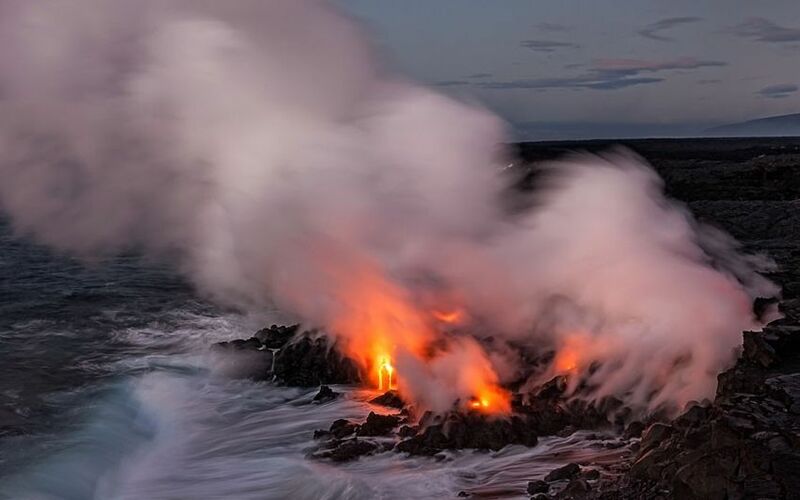 The flow of lava from the erupting volcano Kilaeua reached the ocean.